Cats are amazing. They can make us love them simply by doing their own stuff. Not to mention that once you bring them inside the house this is their house now. You are not the owner but more like their roommate. And not to forget you need to bring them delicious food too. They also enjoy staying active. We have all seen how athletic they can be. They like to spend a lot of their time (especially when being little kittens) running around and playing with everything in sight. They have so much energy that they want to spend. But sometimes you might not have the time or energy to keep up with their antics. And then you end up with a bored cat. This is not good and it can lead to 2 things. They will either sleep, which means you got away with it for now or they will find something else to do. And we’ve seen it, they like to make a little mess. So being the good roommate you are you might consider some toy present for them. Something that will hone their natural hunters instinct. Something that will allow them to explore, play and generally be active. Which is why a good cat tunnel (or cat tube) might be something worthy of their attention. What makes those tunnels great is because cats love to hide and to watch people from hidden places. The tunnels are great for that purpose. They can have additional toys inside. They are great for sleeping and finding a place for some relaxation and solitude. A cat tunnel like this one is great for indoor cats and kittens. It allows them to develop their hunting instincts and stay more active. At the same times it will allow for some nice and secluded area where they can just relax. This is also a great great cat tunnel for hiding. Your cats or kittens can use it for hiding as it is it fairly big. It has 4 tunnels that are 10 inch high and 2 foot long. They have crinkle crackle paper, peephole and they have bell toy and soft ball toy. All this will allow your pet to have some amazing time. The material is a tear-resistant polyester that is wrapped around sprung-steel frame. The tunnel can easily be folded to smaller piece for easier moving and storing when not in use. This tunnel is great place for your cat to play. In fact you can use it with other pets too, it is not made for cats only. It is suitable for dogs and rabbits. This 3-way tunnel has an interesting design that your cat can enjoy while exploring it. It is not just a regular tunnel although a cat would probably enjoy that as well. This one comes with some extra features and cat toys. It has peephole and swinging bell toy for better play variety. There is also one tube that is lined with crackly material that the cat will really like when being inside the tunnel. The tunnel is also of very good size it can easily be taken with you when travelling as it is also collapsible. The tubes are about 10 inches tall and 17 inches deep. This cat tube is great for your cat to have a fun place to stay both active and relax when it desires. It has an interesting design that will provide for some fun time for your cat. It is 47″ in length and 9.9″ in diameter. Your cat can hide in it, play around and use it for sleeping. It will provide for all that and we all know that can really like to have somewhere nice and cozy where they can fit and relax. It is portable and easy to move. 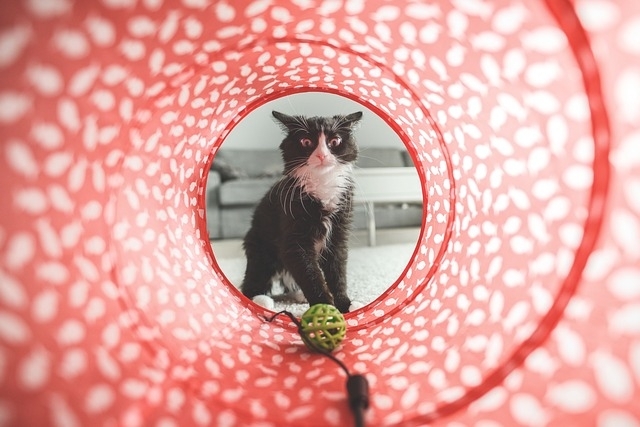 A tunnel like this one is a great accessory that can make your cat a bit more active and at the same time have a place just of themselves. It is S-shaped and can be used with other small animals too. Since cats have a lot of energy they can play around with tunnels like this one. Or on the other end of the spectrum they can spend some nice time sleeping inside the tunnel where they will feel comfortable and cozy. This one has a good design. Several tunnels like this one can be attached to one another to create a maze-like experience which is really fun for the cats. They love to play around in places and hide and watch people going around. It is made with high quality durable materials. Its size is 36 x 8 x 8 inches. The tunnel is great place that can allow you cat to be active and healthy as they move around, explore and have fun. This item has 3 connected tunnels, great for cats and kittens. There is built-in crinkle crackle paper that will provide for more fun and entertaining time for your cat. It also has a peephole and a soft ball toy too that your cat can play around with. It is made with strong, tear-resistant polyester wrapper around a strung-steel frame for more durability. The tunnel are portable, they come withe elastic band and it can be folded down. Each of the tubes is about 10 inches tall and 1 foot long. This pet friendly cat tunnel is a great option to allow your cat to channel its energy while having fun time exploring. At the same time it will allow for a nice cozy place for it to stay and use as sleeping bed too.